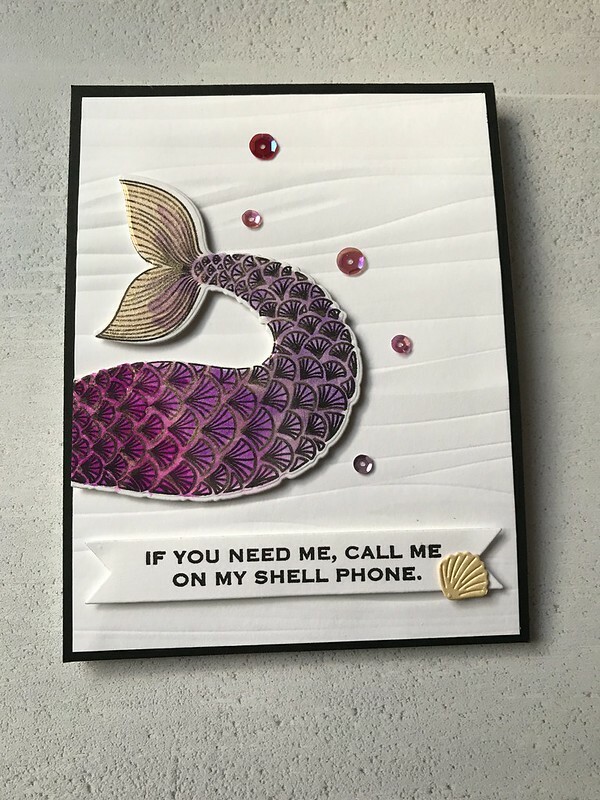 Call Me On My Shell Phone! Mermaids and anything related to them are really big in the card making world right now. For this project, I used the new Essentials by Ellen stamp set, Mermaid’s Tail. I love the detailed pattern on the mermaid tail and the clever sentiments and puns that come along with the set. I stamped the mermaid tail onto watercolor card stock with Versafine ink in Onyx Black. This ink is waterproof and therefore would work well with the watercolor pens I used to color the image. I chose 3 shades of purple watercolor pens (Zig Clean Color Real Brush pens) to color the body of the mermaid tail. I blended the 3 purples to create an ombré look using a watercolor brush. I colored the fin in a yellow-toned color (actual color was called flesh) and blended that color out using the water color brush. Once the watercolors dried, I applied a light gold watercolor wash from Gansai Tambi’s Starry Colors watercolor set. I painted the color wash between the scales of the tail and over the fin itself. The color I used from this set was #905-Light Gold. The photo of the project doesn’t pick up the slight gold shimmer, but when the card is held at an angle, you definitely see. This is an unexpected surprise that the receiver of the card will notice. I die cut the tail after it was thoroughly air dried. I die-cut a double-fishtail banner from white cardstock and stamped it with the sentiment using Versafine Onyx Black ink. All the pieces (mermaid tail, sentiment banner) were mounted onto the card front as you see on the project. I added purple sequins and a small die-cut clam shell for more interest. I like the details of this card and hope you do too. Inks: Versafine Ink in Onyx Black. Cardstock: TIm Holtz Distress Watercolor Card Stock; Neenah Solar White 80# (card front); Black card stock (from my stash); Neenah Solar White 110# (card base). Other: Hero Arts Hombre Sequins in Purple.